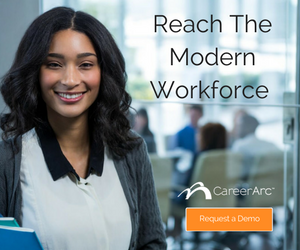 In CareerArc’s #talkHR Healthcare Sourcing Secrets Webinar, I covered some of my favorite sourcing tools and tactics on how to find physicians, nurses, and clinical talent. 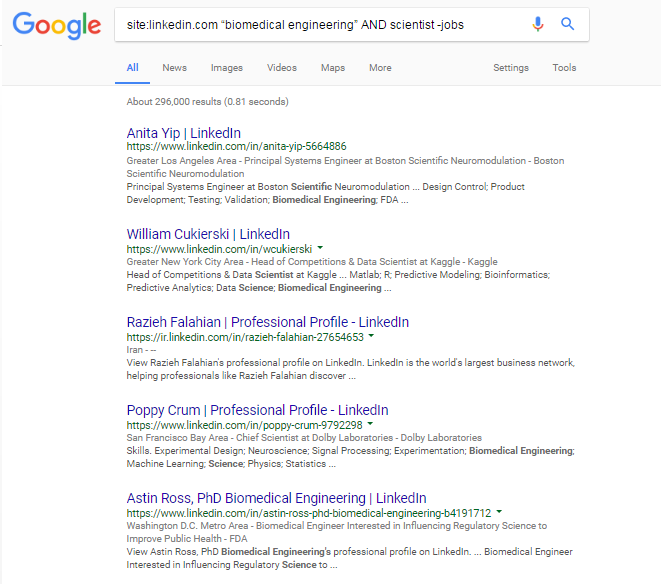 As a follow-up, I thought it would be helpful to revisit some basics, like Boolean search and top keywords and acronyms to aid in your quest for the best healthcare candidates. Sourcing techniques and search strategies I covered are becoming an area of increased interest. So along with the many positive comments we received during and after the webinar, I was also pleased to also see the influx of questions from those who were eager to give these sourcing methods a try but also wanted an overview some talent sourcing basics. Below are some best practices which I hope help answer some FAQs to healthcare talent sourcing. Boolean is using AND, OR, “ “, ( ), and other punctuation to help define and target a search in a search engine. Most Boolean works in Google, and it’s often a way for Sourcers to take a look through an alternative door into a website. I think of Boolean like a Venn diagram, you can either target broad results or targeted skills based on how you use AND and OR. The fancy syntax we use in Boolean strings are built-in “operators” in a Google search. 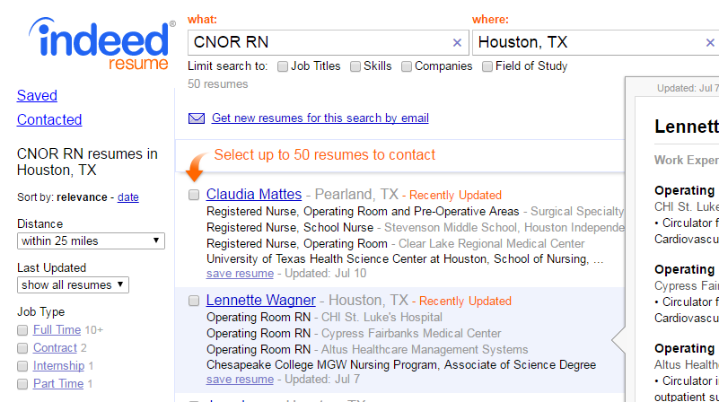 For instance googling (inpatient OR outpatient) AND nurse would pull results for both inpatient or outpatient nurses. If I was to use (inpatient AND outpatient) AND nurse, the results would be much more focused since you are looking for BOTH inpatient and outpatient experience. Again, think of the Venn Diagram, use OR and you get broad results, use AND and you get much more focused list. 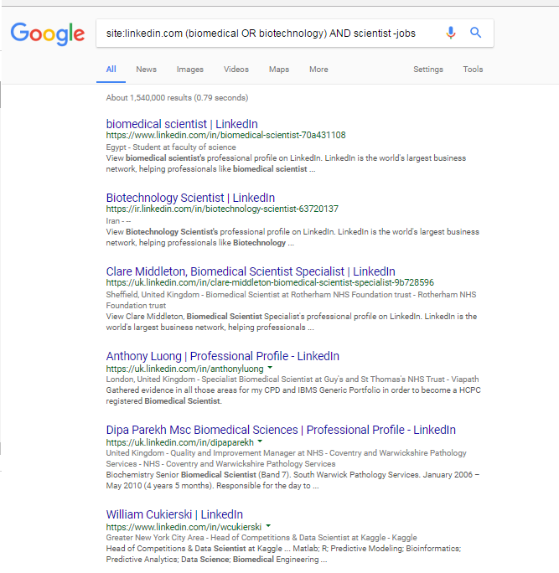 This is telling Google to look for a biomedical or biotech scientist on Linkedin. The parentheses help “hug” the phrases together much like an equation. The -jobs tells Google I don’t want to pull jobs in my search, so think of the minus as an eliminator. You can see from this second list that the results are better focused. Experiment with these ideas and try to think this like writing out an equation. Essentially you are using these operators to help focus your Google searches to pull a targeted list of results. It can seem like a daunting task at times, but I’ve found if you start with a few keywords, you can usually get to what you want. See a full list of Google operators here. In healthcare, we have a ton of acronyms for certification and associations. As I mentioned in the webinar, these can be huge assets in finding targeted pipelines or entire profile sites. Often times, membership sites or associations will let you join and browse their member list for free or at a low cost if you simply sign up. AANP, Healthgrades, and Doximity are all searchable databases for this type of role. 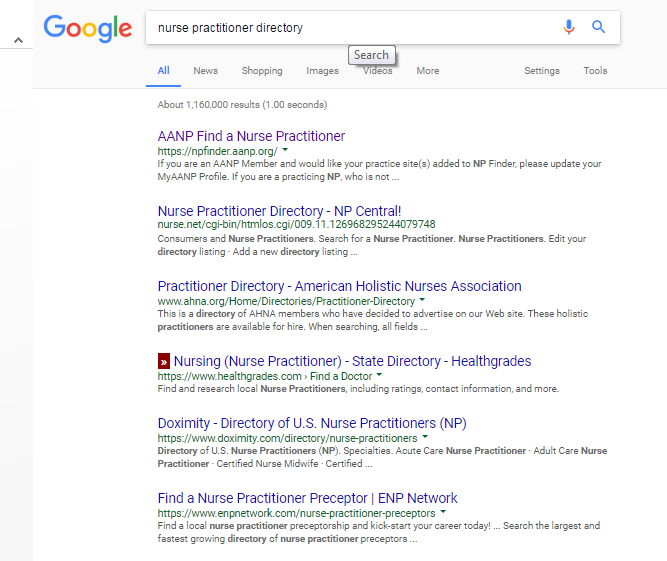 You can uncover similar directories by combining certifications and associations with keywords like directory, roster, attendee, list, registry as well as others. Many times I overthink my process, sometimes a few certifications and keywords can get me to the information more effectively than an advanced boolean string. 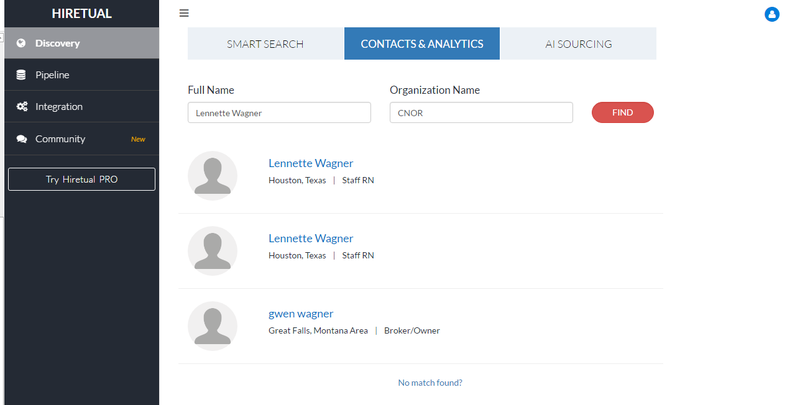 Hiretual is a tool that does a bit of everything, building boolean site searches, searching multiple platforms, and implementing pipelining features. However one of the reasons I use this tool daily is the new FREE cross referencing features. Often times you may pull a list that has limited information. Sometimes all I literally have is a name and a certification. Hiretual’s Contacts and Analytics shown below is a great help in unlocking more information quickly. Let’s take one of the CNOR resumes we pulled from the previous Indeed. And let’s also pretend I only have her name and certification. A bonus of this tool is that it can sometimes pull direct emails much of the time, giving you a secondary point of contact. I also really like the fact it pulls data more often than not whether I use an organization name or a certification (like we did in this example). If you aren’t using Hiretual for searching, definitely take a look at this feature. There is a growing list of tools out there, and many different ways to search for data. However, it’s important to remember some tools may not be ideal for your industry, location, or population. The trick is to experiment, find new resources when you need to, don’t forget the resources of the past, and combine and innovate techniques that make sense to your process. One of the best resources out there is other people, and I’m constantly learning new and inventive techniques through my peers. I know this is a lot of information, so feel free to reach out to me directly if you do have questions. It was an honor to be part of the CareerArc’s #talkHR webinar, and hope what I shared has helped you deepen your search skills and better your approach to sourcing that next great candidate. As a Senior Recruiter focusing on Sourcing at MD Anderson, Greg Hawkes recruits talent to #endcancer at the top ranked hospital for cancer care in the US. 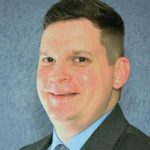 He’s worked as both a Technical Recruiter and Sourcing Analyst for healthcare, engineering, biotechnology, manufacturing and many other industries. He’s an ongoing contributor to SourceCon with over 25 articles with topics ranging from site searches, CSEs, to deep dives and URL Sourcing. While preparing to speak at several recruitment conferences, he built the HRSourcingToolbox with Free Recruitment Tools to share with the Sourcing Community. He is a huge fan of emerging technologies and Boolean syntax and always willing to share a new trick or technique to find the elusive purple squirrel. 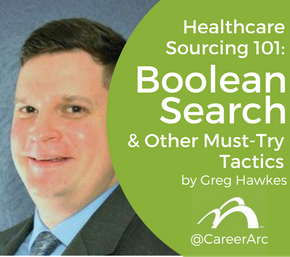 Learn healthcare sourcing basics from Greg Hawkes, like Boolean search and top keyword queries, to aid in your quest for the best healthcare candidates.